About 400 industry stakeholders met in the Ritz Carlton Hotel in Doha in early November to attend the first Green Expo Forum organised by the Gulf Organisation for Research and Development (GORD). The three-day conference offered presentations by experts from Gulf countries and the IEA Solar Heating and Cooling Programme (IEA SHC), which held its biannual Executive Committee meeting at around the same time. “The GORD conference was a great forum for presenting the research work from the IEA Solar Heating and Cooling Programme,” said Ken Guthrie, Chairman of the IEA SHC. 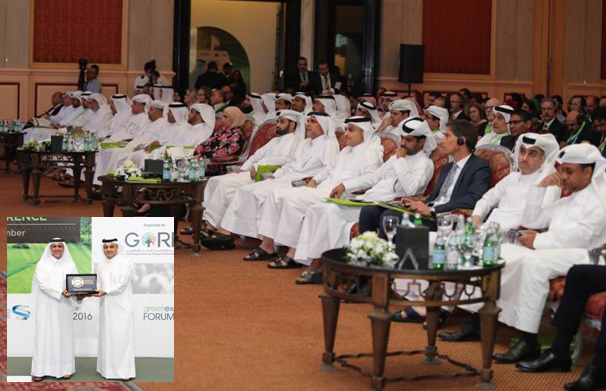 GORD had organised the Green Expo Forum in collaboration with the Supreme Committee for Delivery & Legacy and Qatari Diar Real Estate Investment. The first-day event was titled The Carbon & Climate Change Summit. The second and third day featured the Sustainable Built Environment Conference. GORD used the increased interest by the public sector and the media to present several Sustainability Awards to governmental organisations and private-sector companies on the first day of the conference. Qatar´s Public Works Authority Ashghal won two for its implementation of the Global Sustainability Assessment System (GSAS) at several newly built healthcare and educational facilities. It adopted the minimum 3-star standard of GSAS in March 2016 and has since certified 24 school buildings, five mosques and several healthcare centres. “In schools, we have reduced energy usage by 30 % and water consumption by 50 %, both mandatory targets for 3-star certification,” Kareem Mohamed Ali Mansour, Design Engineer at the Building Design Department of Ashghal, explained during his presentation. Energy consumption has been lowered by passive design strategies, the use of high-insulation materials and a selection of highly efficient HVAC systems with heat recovery units. The 3-star public buildings do not have active solar systems based on photovoltaics or solar thermal. Space restrictions and a lack of knowledge about the durability of these systems considering the harsh, dusty climate of Qatar had so far prevented the integration of active solar systems in public construction, several local experts said. To reduce water consumption, dual-flush toilets and efficient water-saving devices are being installed and the irrigation demand of parks is being cut down as well. Grey water, however, has not been utilised yet. In addition to the two mandatory categories of energy and water, GSAS has six other categories: urban connectivity, site, materials, indoor environment, cultural & economics, and management & operations. Werner Weiss (AEE INTEC, Austria and co-author of Solar Heat Worldwide), Sabine Putz (S.O.L.I.D., Austria, and Operating Agent of Task 55, Towards the Integration of Large SHC Systems into District Heating and Cooling Networks) and David Renné (Head of Task 46, Solar Resource Assessment and Forecasting) were three of the ten Green Expo Forum speakers from the IEA SHC Programme. During the first day of the conference, it was announced that Sharjah & Kuwait Manufacturing, one of the biggest AC manufacturers of the region, signed an agreement to commercialise GORD´s newly patented AC cooling system. The GORD@smartcool unit combines air ventilation and air conditioning into one device. It is based on desiccant cooling, i.e., air cooling by removing moisture. Dr Esam Elsarrag, GORD R&D Director, said that a prototype unit of 52 kW had been installed and tested at the Qatar Science and Technology Park and first estimates put electricity consumption at 50 to 75 % compared to conventional compression chillers. Daniel Mugnier, Senior Researcher at Tecsol and Head of IEA SHC Task 53, New Generation of Solar Cooling & Heating Systems, emphasised during his two presentations that solar cooling had great potential in the Gulf states because of infinite solar resources and high cooling loads. The French researcher added that 50 % grants would be necessary to increase the attractiveness of solar cooling solutions in countries with subsidised energy costs, such as Qatar. Mugnier proposed a USD 4.5 million R&D and demonstration programme to develop solar cooling across the Arab region. The programme was to cover the R&D costs for adapting heat rejection, storage tanks and system kits to regional requirements and implement two 100-kW PV cooling as well as two 1-MW solar thermal demo systems. The funding amount could be made available by cutting the energy subsidy budget. He recommended to bring together international and Arabic expertise for this programme. The big requirement for worker accommodation over the coming years was emphasised by Dr Sean Cashin, Project Director at Daruna Development. He said that 600,000 new units would be needed nationwide by 2018. Daruna has recently secured a contract to build workers’ villages with around 200,000 beds in total and operate them over the next 25 years. The company founded in 2013 will also provide these villages with water treatment and waste management services as well as cinemas, healthcare centres, laundries and catering. There are no plans for active renewable energy systems. Around 2.3 million people live in Qatar today and only about 15 % per cent of them are native Qataris.